Google is launching a new cloud storage service today that has the potential to change how many companies, ranging from startups to enterprises, view online storage. With Google Cloud Storage Nearline, businesses can store the data they or their customers don’t frequently need to access (think backups, log files or older photos), for $0.01 per gigabyte at rest. Cold storage isn’t a new concept. 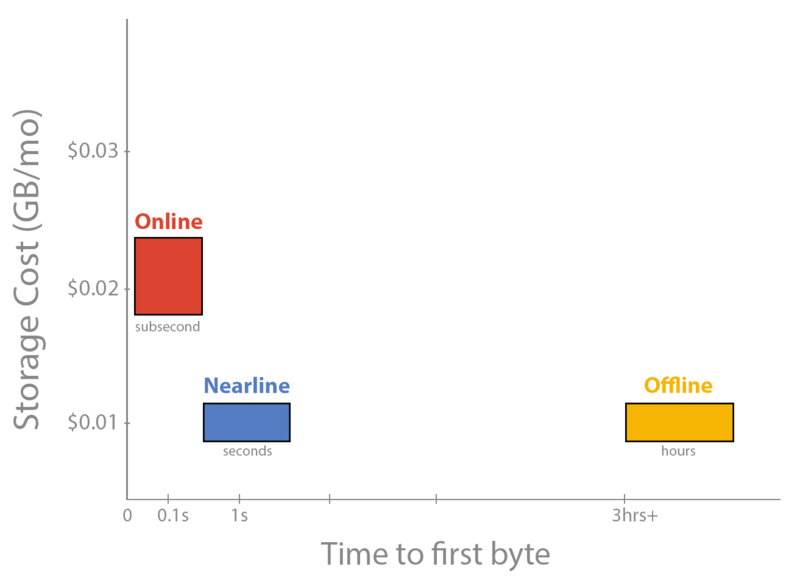 Unlike other cold storage services like Amazon’s Glacier, where it can take hours before your data is available again once it has been put on ice, Google promises to make your data in Nearline available again in about 3 seconds. As Google director of product management for the Cloud Platform team Tom Kershaw told me earlier this week, he believes that the gap between the cost of online and offline storage has to decrease. Online storage has always been relatively expensive, but if you run a large email service, for example, your customers expect to be able to search through all of their messages immediately. You can’t just put older messages into offline storage and then tell your users to come back in an hour once their batch job has finished. Similarly, businesses may want (or need) to keep their log files around for as long as possible. But once they are moved offline, you can’t quickly analyze historical data anymore. With Nearline, Google wants to blur the line between standard online storage and cold storage so businesses don’t have to delete their data anymore or move their files to cold storage. According to Kershaw, Google is able to offer this competitive price — which is on par with Amazon’s Glacier — because it is able to host all of its data on a single system, no matter whether it’s online or “nearline.” This commonality of systems, he argues, is pretty unusual. Historically, storage companies built two different systems, but the hardest and most costly thing about offline storage is actually moving the data between these two systems. On the backend then, Nearline uses the same system as the rest of Google’s storage products, with exactly the same encryption and other security features. It also shares its APIs with Google’s standard online storage service. Google expects that many of its early customers will use the service primarily to store photos, videos and documents. Many companies pay a lot to keep these online, just in case a user ever needs them. To reach an even wider market, Google has partnered with a number of storage companies, including Veritas/Symantec, NetApp, Geminare and Iron Mountain. While all of these will get Google’s new service in front of a lot of enterprise customers, the Iron Mountain relationship is interesting because that company will allow users to send in their hard drives and have them securely uploaded to Nearline.